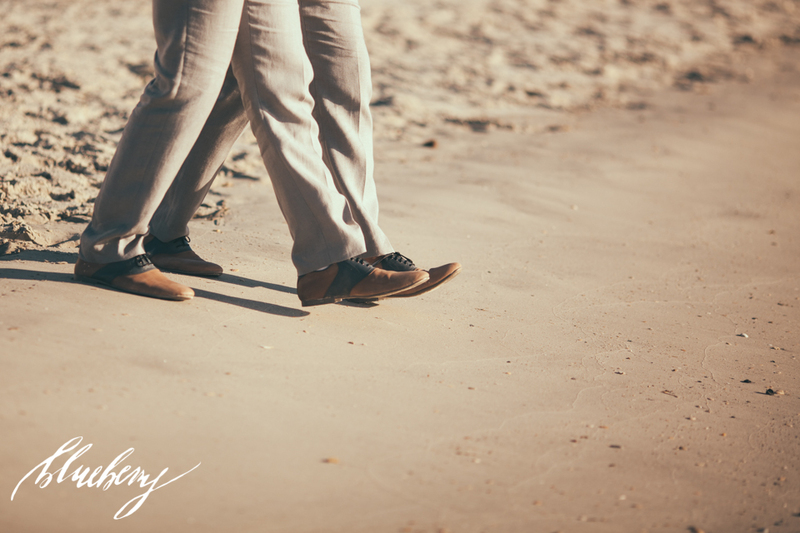 This handsome couple made our day, kicking off our summer 2013 season with a wedding located right where we all love to be…the beach! They also were just featured on the blog Equally Wed, a great feature all about their coastal wedding. 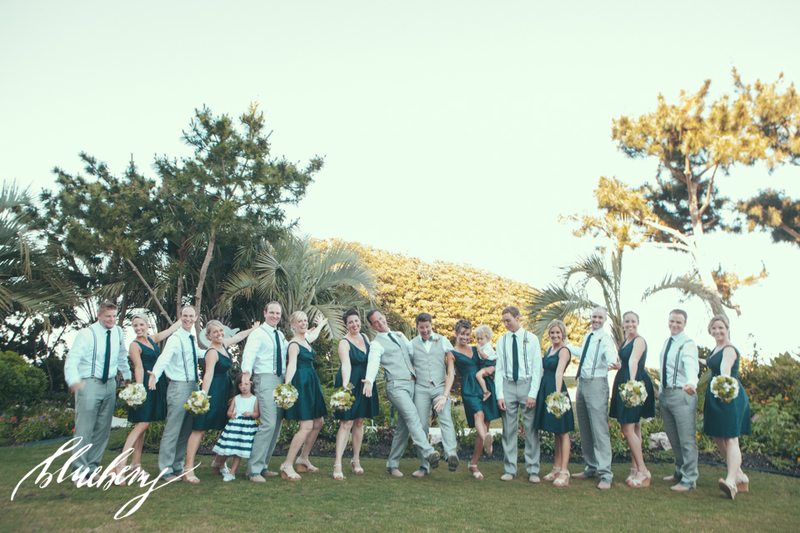 Michael & Kyle knew exactly how to complement their breathtaking beach surroundings, incorporating a contemporary twist to the classic colors of navy and green. Their vision was to create an overall look that was as natural as their coastal setting, as well as infuse a modern element for style. And oh boy, did we love designing this wedding! Coastal classic met contemporary seamlessly with voluminous bridesmaids’ bouquets full of lush textures, pops of green viburnum, and the unexpected texture of succulents. They were perfect for those divine midnight blue dresses the bridesmaids donned. Inside the ballroom tall cylinders with willow swirled about, accented by low mirrored cubes of white hydrangea to create a clean but dramatic look. What was out favorite bit of this wedding? The Grooms’ boutonnieres. Styled to complement this handsome couple’s tailored suits and a nod to southern living, a gardenia boutonniere and a sage & cotton boutonniere were both as sophisticated as the couple were themselves. Congratulations Michael & Kyle! DESIGNER’S TIP: To envision a clean, cohesive design doesn’t mean it can’t be a show stopper. E.g. You don’t need to add all the trimmings in the box to be fantastic. 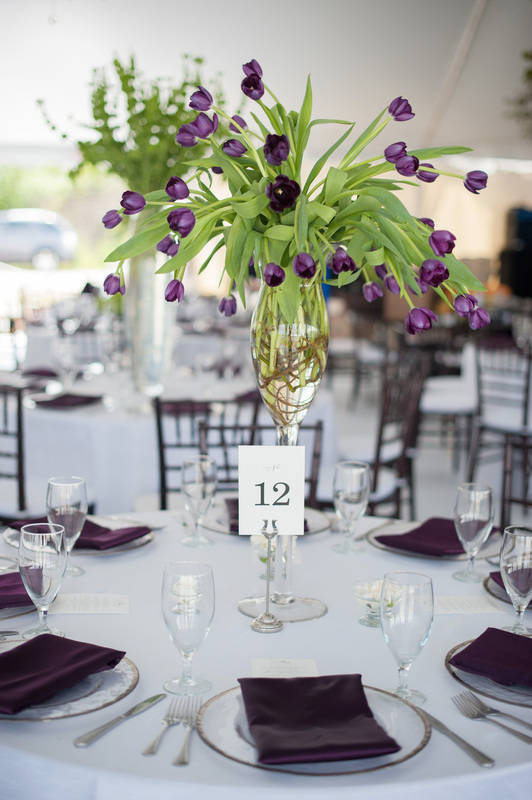 This couple’s wedding flowers stood out just as much as their quality threads did (literally). 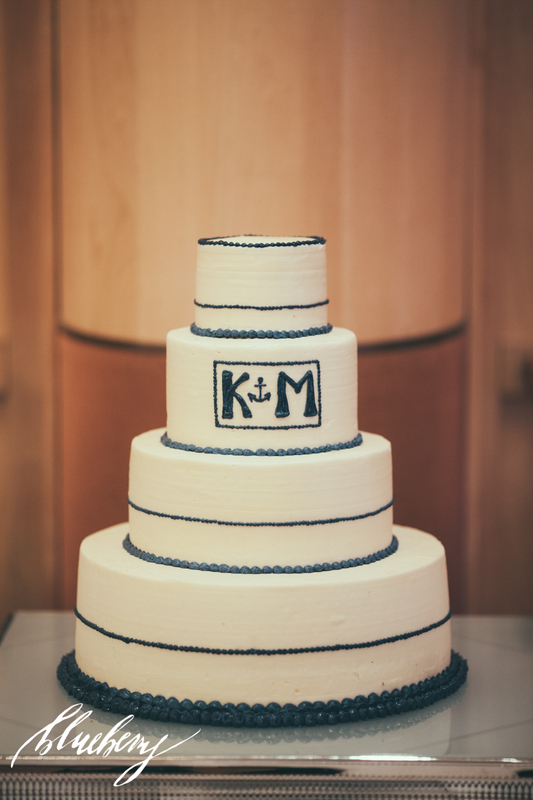 Their color scheme and the complementing designs allowed every detail to ‘pop!’-from their setting, to their wedding party’s attire, to their nautical cake. It all seamlessly tied together! Look at all this seasonal loveliness! We just can’t get enough of this fall bouquet from our lovely October bride, Catherine. Look at all that texture and subtlety in the altering shades of green. Catherine’s design vision of elegant, simple and harvesty left us giddy over the fact that this wedding would show why we love fall celebrations! Texture. Texture. Texture. Our elegant bride’s dress was the perfect contrast to our seasonal bouquet, it left this unexpected appeal of nature matched with sophistication (we loved it!) 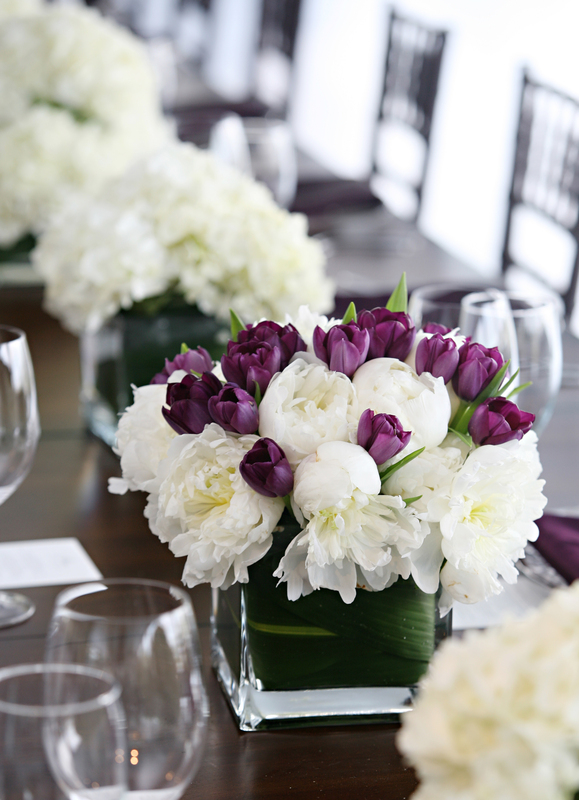 With the seasonal chic color choices of deep purples and a mix of greens, all of our favorite fall flowers came to the party, from purple kale (yes, we said kale), to hydrangea, to calla lilies, lavender stock and succulents. All these alluring fall flowers were designed to elegantly bring the outdoors in! 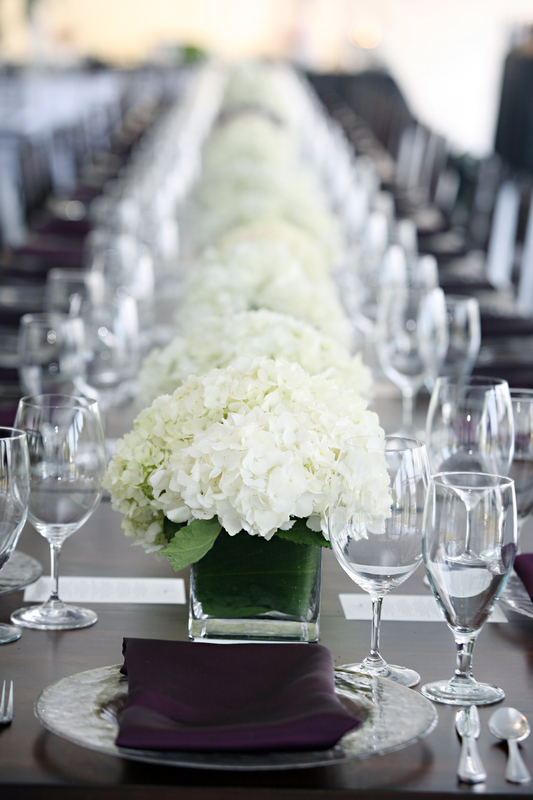 The bridesmaids’ eggplant dresses were a great inspiration for autumn filled kale & hydrangea bouquets, as was the elegant satin tablecloths that were the perfect detail to juxtapose our harvest filled centerpieces. This wedding was simply sublime. Enjoy! Inspired by our recent feature on the adorable blog “Every Last Detail” (and standing knee-deep in clouds of white hydrangea and bright green floral galore) this week’s post is all about this popular color combo’s ability to perk up every lovely detail. There is no doubt, nature’s green and white hues put a smile on every guests’ face...time after time. 1.) Nothing dresses a door better than an abundant hydrangea wreath. Charm….Charm…Charming! 2.) Ooooh, this lovely mix of orchids, freesia, cabbage roses, calla lilies and spray roses, accented by tiny pops of green, is the perfect presentation of divine elegance. 3.) “Mums” the word on modern meets striking. 4.) Charm and contrast are at the forefront of this farm fresh design as bells, stock, ranunculus and hydrangea compliment the outdoorsy texture of pine and burlap. 5.) 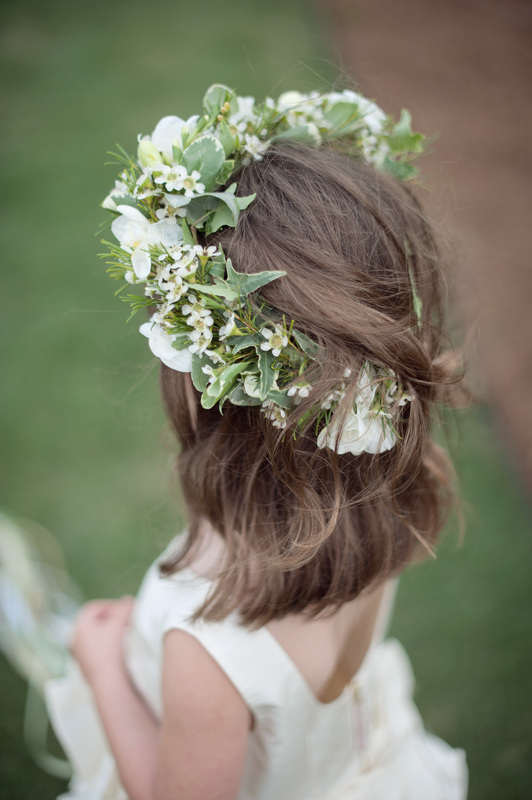 It doesn’t get sweeter than this, green orchids truly do create the most charming halo for little flower girls. 6.) Who says wreaths on cars (or golf carts) are only for Christmas? We absolutely adore this over sized, very fun detail. 7.) Never negate the timeless appeal of big blooms, abundance is never out of fashion when it comes to flowers (wink). 7.) 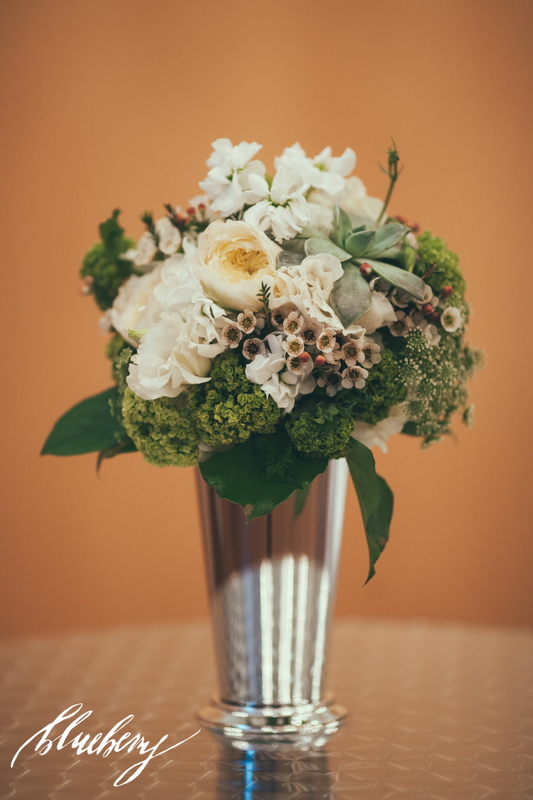 This bouquet is a vision of timeless texture, perfectly fastened with a hint of tradition. 9.) 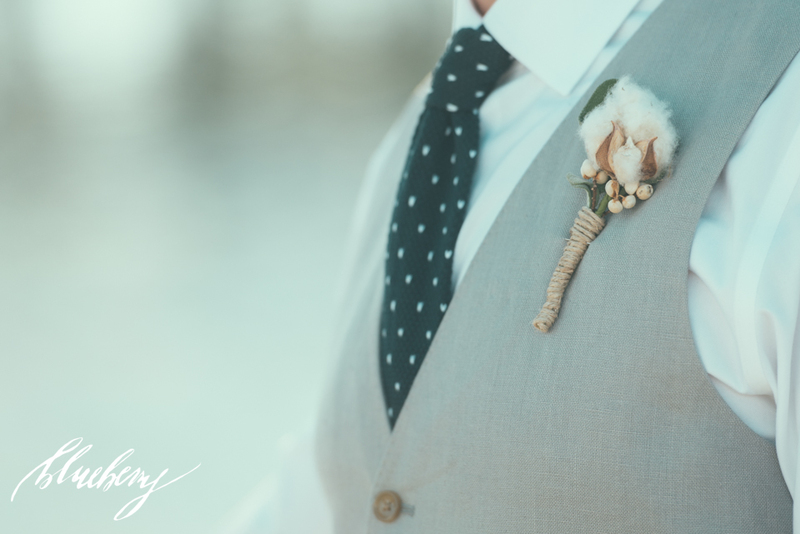 Let’s not forget how appealing a well dressed groom can look dressed sharply in a charming array of spring flowers. 10.) Magnolia leafs are the perfect border to any door wreath, exuding sophistication and a boat load of southern charm. 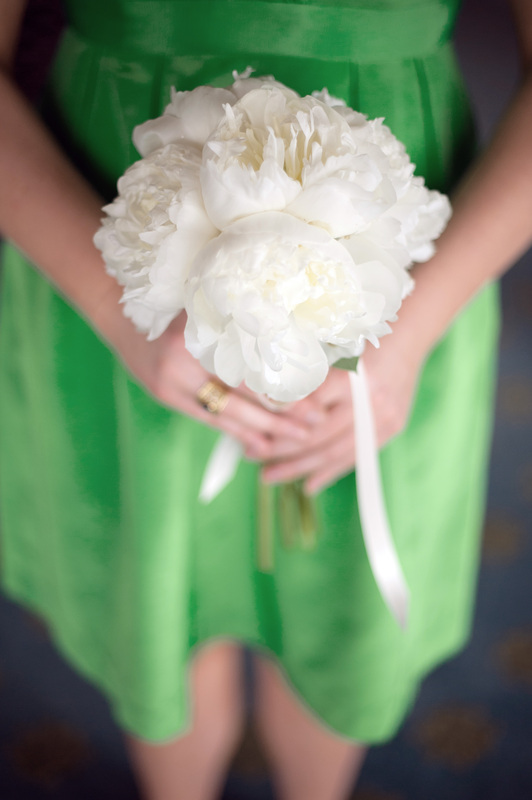 Oh, the appeal of white and green…It truly is one heck of a cheerful combo! Lauren and Michael’s May 2012 wedding still leaves us giddy over all the attention to detail congenially fashioned together to give their guests a party they’d never forget (and we’re pretty sure they never will). Lauren’s vision of a simple, modern design full of abundance in the refreshing palette of green and white, accented by purple, allowed us the delightful opportunity to play. And oh boy, did we ever! 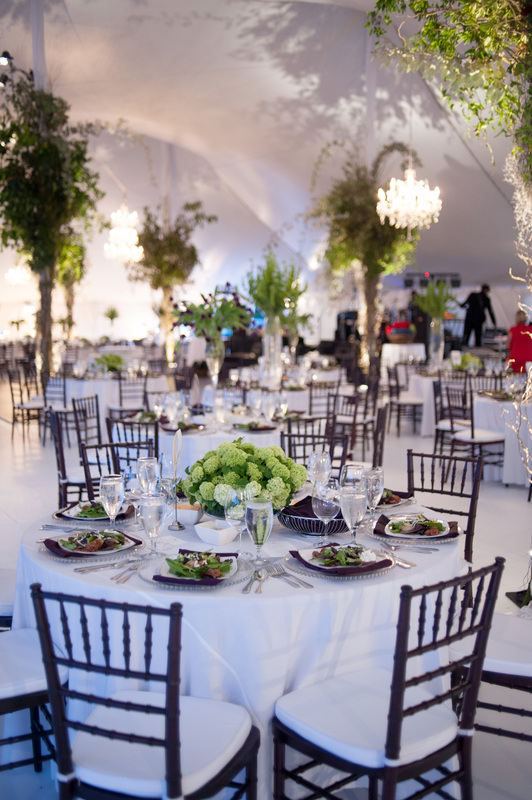 Not a detail was missed from the twinkling willow branches climbing the tent poles with smilax, to the sumptuous hydrangea & viburnum dangling from the chandeliers, to the varying lush table arrangements mirroring the enthusiasm and elegance of the couple themselves. 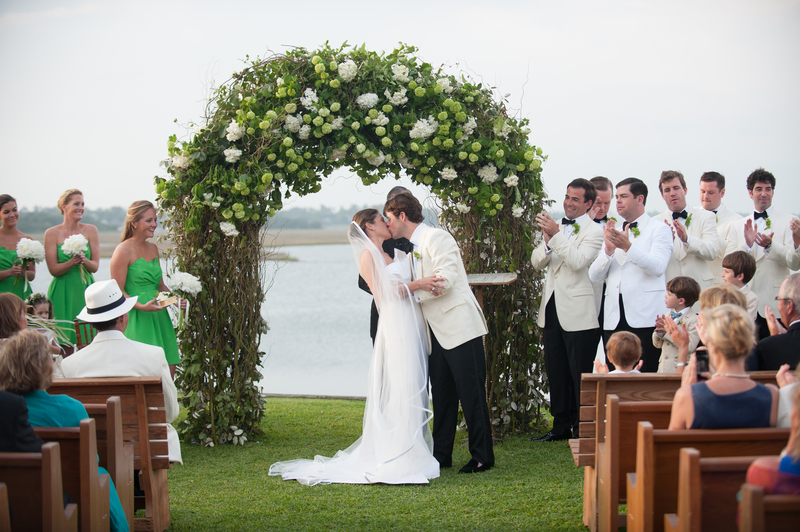 One of the most endearing detail was the couple’s request to infuse family traditions into their aesthetic, Lauren’s family prayer-book delicately fastened with two gardenias was southern sentiment at its best…sigh…now, this was a party! 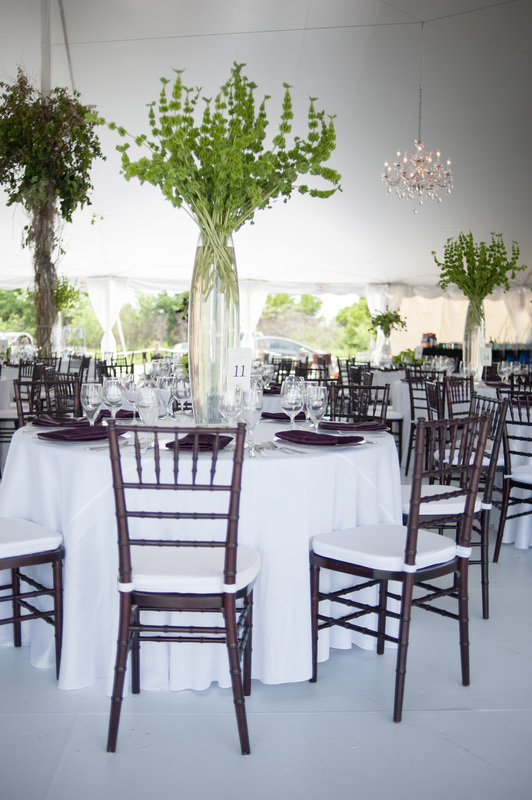 The Arboretum and BlueWater Grill were the settings for Pattie and Matt’s eclectic wedding. 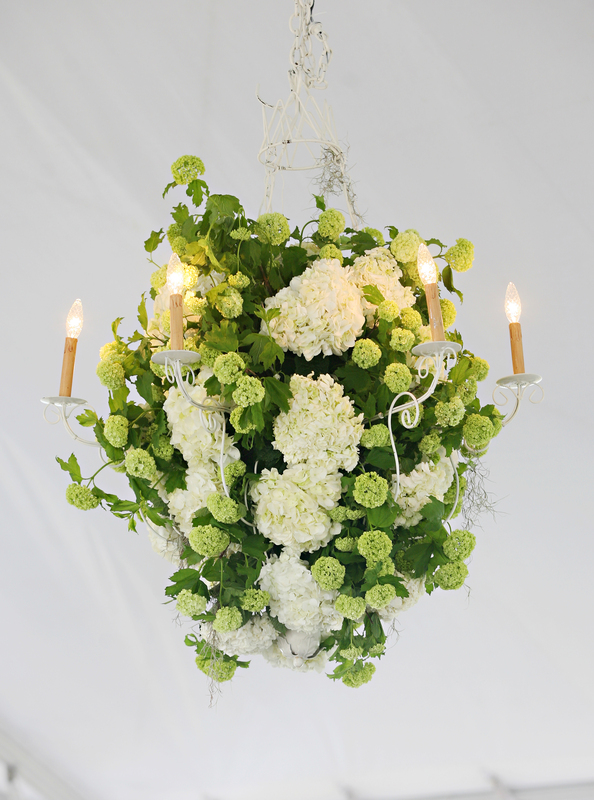 The Bride’s bouquet was made of White and Green Hydrangea and White Roses. 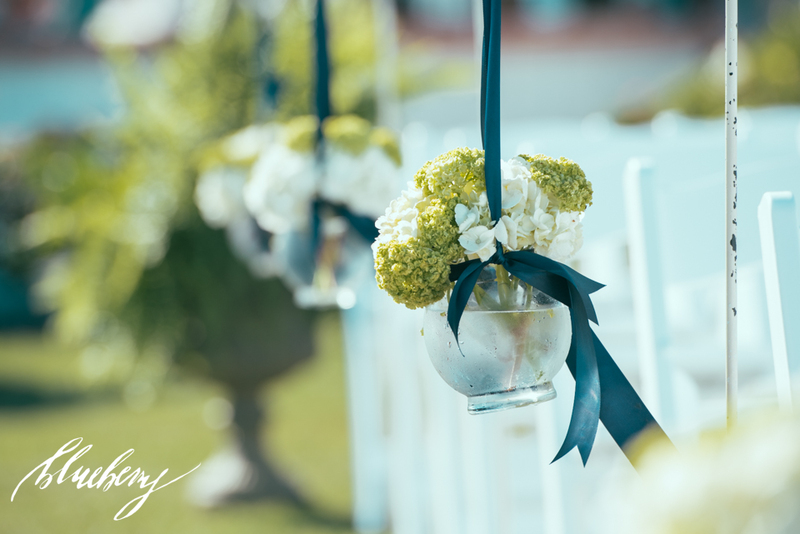 Guest tables were filled with lanterns and eclectic vases filled with Bells of Ireland, Hydrangea, Ranunculus and White Stock. A special thanks to Reese Moore Weddings, BlueWater Grill and The Arboretum.